Officials in Tijuana have declared a humanitarian crisis in response to thousands of mostly Central American migrants who have arrived in recent weeks and overwhelmed temporary shelters in the Mexican border city. At least 5,000 recent arrivals as of Thursday night were camped in Tijuana, which is serving as a staging ground for the migrants to apply for asylum in the U.S. City officials estimate as many as 1,200 migrants arrived from the nearby city of Mexicali in less than 24 hours between Tuesday night and Wednesday afternoon, straining temporary shelters that were already operating at capacity. At least 2,000 more migrants are traveling in a second caravan currently moving north through the central Mexican states of Jalisco and Queretaro — most are expected to end up in Tijuana in the coming weeks. In response to the influx, Tijuana Mayor Juan Manuel Gastelum declared an international humanitarian crisis and blasted the federal government for allowing the migrants to concentrate in the city. The Tijuana municipal government says it is spending about $27,000 per day to house and provide care to the caravan migrants in the city. Gastelum, who has drawn criticism for his tough rhetoric about the caravan, warned that he would not authorize more spending as additional migrants arrive. “I will not compromise public services,” Gastelum said. “I will not spend Tijuanans’ money, I will not bring Tijuana into debt now, in the same way we haven’t done so these past two years. 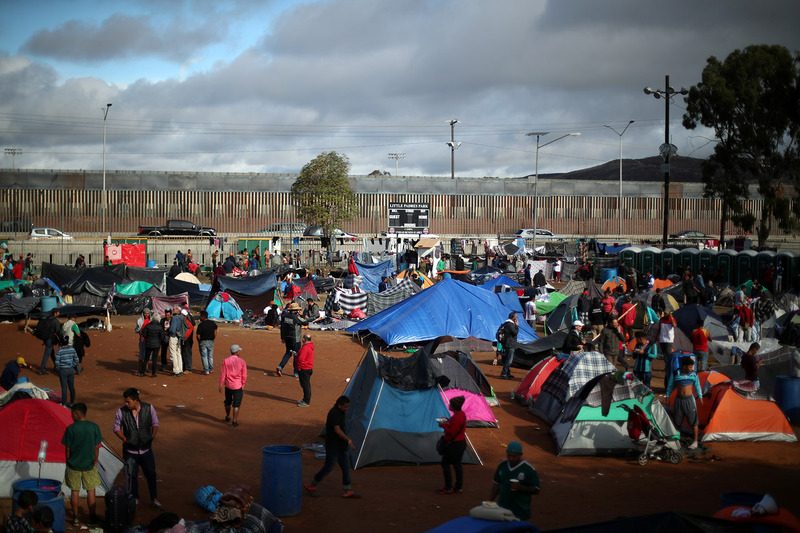 Nearly all of the caravan migrants are being sheltered in Tijuana’s Benito Juarez sports center. Officials say the center, which is already over capacity, cannot hold any more migrants while still maintaining even minimal safety and sanitary conditions. As the temporary shelter has come to resemble a refugee camp, Tijuana officials say a lack of coordination with the federal government has hindered the on-the-ground response to the caravan.